Left: Colorized image shows the manipulator probe used to place a nanowire (blue) into a hole drilled in the mounting post (green). Right: The nanowire is welded in place with platinum and the manipulator arm is removed. Semiconductor nanowires (NWs) are vanishingly small: NWs from a recent batch made by scientists in PML's Quantum Electronics and Photonics Division measure about 200 nanometers in diameter (less than 1/500th the thickness of a human hair) and 6 to 10 micrometers long, with embedded layers as thin as 3.3 nm. But despite their size, semiconductor NWs are poised to play a very large role in solid-state lighting, chemical sensors, and nanoscale scientific probes. First, however, researchers will need to determine how to fabricate high-efficiency NW light-emitting diodes (LEDs) that are reliably uniform in composition and morphology, each with the same optical emission spectrum and other critical properties. And that, in turn, will require a detailed understanding of how to achieve the optimal placement and localization of different atomic species as the wire and its various layers are formed. Now Norman Sanford and colleagues from the Optoelectronic Manufacturing Group, with collaborators at the Colorado School of Mines, have made major progress toward that goal in a new study. * They used the group's signature molecular beam epitaxy (MBE) method to grow GaN nanowires with thin layers of InGaN embedded at intervals. To use such a NW as a light source, a voltage is applied to the wire, and the InGaN sections form quantum wells that trap electron-hole pairs which recombine to produce luminescence. "The quantum well makes this recombination-luminescence process way more efficient than if you just had a simple, abrupt p-n junction in GaN," Sanford says. "However, in order to be an efficient source of luminescence within a narrow wavelength band, the quantum well must remain compact and uniform. If the indium diffuses into surrounding regions, the well gets spread out, and it won't work efficiently. Different spatial portions with different indium concentrations will have different bandgaps and thus tend to emit light at different wavelengths. We wanted to investigate which factors affect whether a well remains localized or is dispersed as the structure is grown." Diagram of a nanowire with multiple layers of InGaN embedded during the growth process. Optimal growth conditions for the separate GaN and InGaN segments can be different. So the researchers fabricated different NWs over a range of temperatures and molecular-beam properties, and then examined the effect those conditions had on the wells. To do so, they used a version of a technique called laser-assisted atom probe tomography (L-APT). In an ultra-high vacuum chamber at about 54 K, a constant high voltage is applied to a NW. At the same time, energy from a pulsed ultraviolet laser is directed at the extreme tip of the wire. Atoms at the tip ionize, are pulled from the tip under the high electric field, and travel to a two-dimensional ion detector about 90 mm away. The detector records the location of each arriving ion; then by using the laser pulses as timing signals, researchers can determine each ion's time of flight – and hence its charge-to-mass ratio. The ion impact events on the detector are mapped back to their origin from the sample tip, and the accumulated data are used to build up a 3-dimensional picture of the chemical composition of each part of the wire. The group found that wire formation conditions had a very significant effect on the localization of InGaN layers. "It is possible to induce diffusion and dispersal of the InGaN layers if the growth conditions of the subsequent GaN layers are not adjusted correctly to ensure that the InGaN regions remain intact," Sanford says. "In some instances we find that the consolidation of the InGaN layers can be destroyed during the subsequent growth of a GaN segment—even without any obvious outward signs of this revealed in the nanowires. 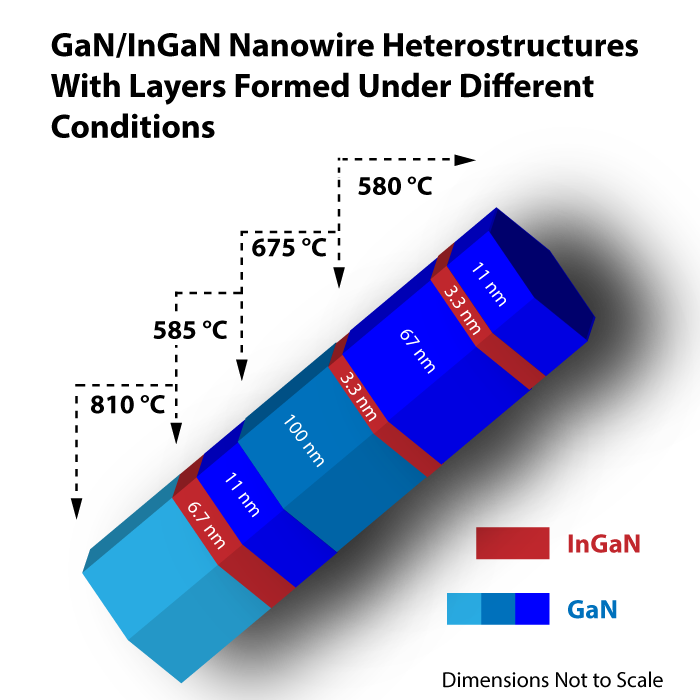 Moreover, the InGaN quantum wells that remain localized are found to be in the shape of thin conical InGaN shells embedded in the GaN nanowires (and axially concentric with them) rather than flat disc-like structures. "L-APT is particularly well suited to showing a 3D rendering of the InGaN quantum wells and the distribution of indium throughout the nanowire device. As far as we are aware, this is the first time L-APT has been used to examine the impact of growth process variations in the study of these structures." 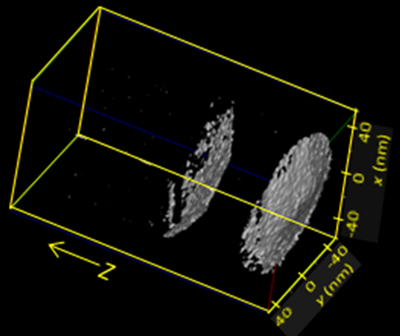 The results were in good agreement with NW measurements made by another composition-revealing technique, high-resolution transmission electron microscopy. The scientists also found that varying certain L-APT parameters, such as the laser pulse energy, can cause spurious measurements of the apparent ratio of gallium and indium to nitrogen, indicating a seeming (but nonphysical) overabundance of the metal constituents compared to nitrogen. This phenomenon, the researchers speculate, may result from high laser pulse energies causing neutral nitrogen atoms to desorb from the NW. Those atoms would not be counted by the ion detector. Not surprisingly, it is uncommonly difficult to manipulate individual nanowires of these dimensions. For the L-APT analysis, a tungsten manipulator probe was "welded" with platinum to a single wire. Then the wire was placed in a hole drilled in the sample post and welded in. Finally, the manipulator probe was snapped off, leaving the NW standing vertically on the post and ready for L-APT analysis. "Probably the greatest challenge is coming up with a reliable mounting scheme so that the samples survive the entire L-APT analysis process without catastrophically fracturing," Sanford says. "It required dozens of sample mounting attempts in order to attain the results presented. The problem arises since the electric field strength at the tip of the sample during operation is on the order of 10 V/nm. That's a pretty high electric field, but it has to be that high in order to rip ions and clusters of ions right off of the sample tip for subsequent time-of-flight mass spectral analysis. We are still working to improve the sample mounting scheme to make it more reliable and survivable." But for now, "even with the likely ambiguity in the absolute 3D concentration mapping of nitrogen," says Sanford's colleague Kris Bertness, leader of the Semiconductor Metrology for Energy Conversion project, "it is clear that the L-APT-resolved 3D mapping of gallium and indium has, for the first time, provided essential information to help guide the growth process for these important GaN/InGaN nanoscale heterostructures." * N.A. Sanford et al, "Laser-assisted atom probe tomography of MBE grown GaN nanowire heterostructures," forthcoming in Physica Status Solidi.